The Bellevue Log Cabin is located at 1805 Hancock St. 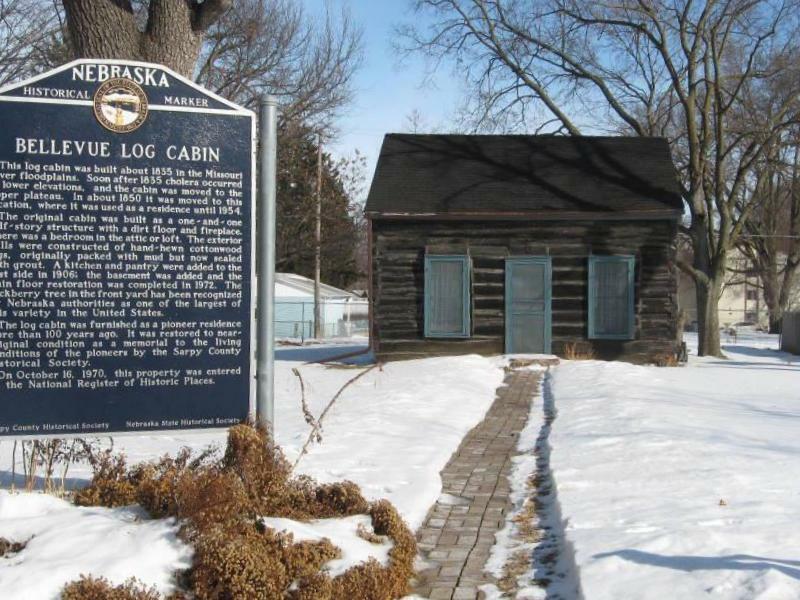 The old log cabin in Bellevue is regarded as the oldest building in Nebraska. According to local legend, it was constructed between 1830 and 1835 and built close to the Missouri River as a part of the Jacob Astor Fur Trading Post. During the cholera outbreak of 1835, the log cabin was relocated further away from the river, purportedly at the urging of Marcus Whitman. In 1850, the cabin was moved for the last time onto what was at the time the Presbyterian Mission’s property. 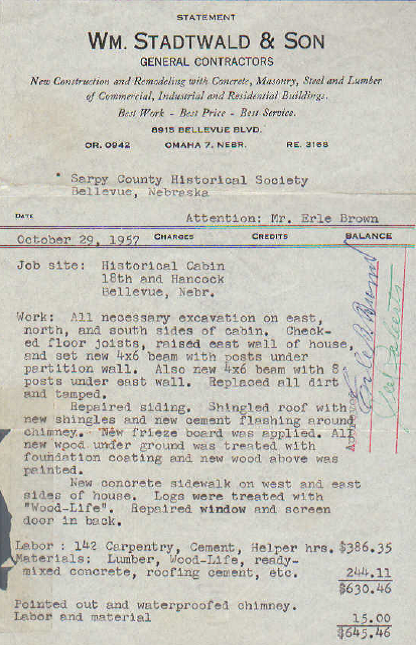 Repairs made to the cabin in 1957. The cabin was built using cottonwood logs measuring nearly a foot thick with Indian lodge pole style rafters. Over time, the cabin was enlarged and is twice its original size. Siding was added but has since been removed. Since the 1950s, periodic restoration projects have not only restored the cabin to ‘near original condition’ but also undertaken the addition of a basement, new roofs, replacement of rotten logs, and structural reinforcement work. The cabin has been home to several noted settlers and important figures over the years. In 1856, Joseph Betz used the cabin as a carpenter’s shop while he built the Old Presbyterian Church on Franklin Street. Other tenants during the 1850s included the family of James Gow. Legend states that Gow purchased the cabin from an Indian for $10. Gow went on to serve as County Judge for several years. Judge Gow sold the cabin to Mary Kinney in 1868. She was the first of two widows to own the property. She raised the surviving three of her six children in this home. In 1885, Mary sold the property to Josephine Mountain. Josephine’s husband, Moses A. Mountain, died a mere six months prior. The property stayed in the Mountain family’s hands until 1954 when the Sarpy County Historical Society purchased the property. On October 16, 1970 the cabin was added to the National Register of Historic Places along with the Burlington Depot and the Presbyterian Church. The Sarpy County Historical Museum and Society in conjunction with the City of Bellevue continue to oversee the property. Tours of the cabin can be arranged by contacting the museum.